We met the Brodegard family about a year ago when they won our elMundo Contest. That’s the winning bike in the photo below. They had set out on this crazy adventure to spend the whole year not owning a car and just using bikes to get around. While that just seems like a hassle at best it becomes an adventure when you learn they have three little kids and live in Minneapolis, MN. burrrrr. 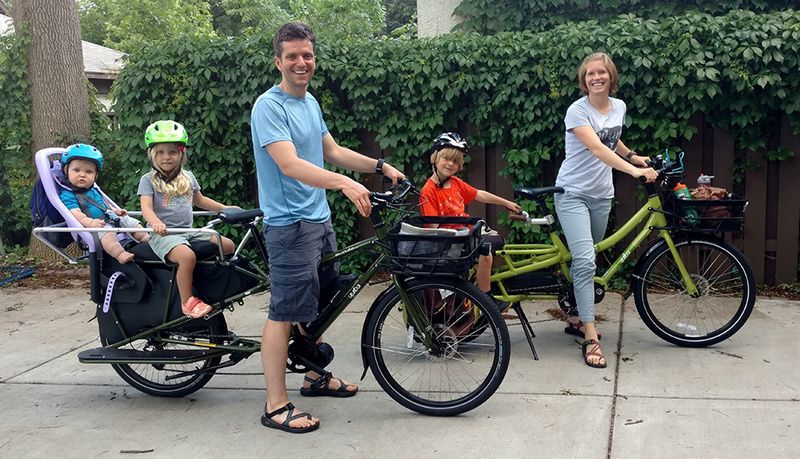 While the Bike Year started out as an experiment in family biking, it quickly became a lifestyle. They shared stories of their adventures on their blog The Bike Year. What was the bike year about, exactly? Last March our family got rid of our car. We gave it to my inlaws, who live in Utah. After that, our main form of transportation was bicycles. We bought the Yuba Spicy Curry, and then Yuba sponsored us with a Yuba elMundo. We had a couple of other bikes, too. Did you use a car at all this past year? Yes. Sometimes we used Uber, and sometimes we borrowed or rented a car – like if we went on a trip or vacation. But that is cool though. This past year we haven’t owned a car. We were not trying to start a new religion, we were just trying to have a cool adventure. Was it worth it to give up your car? Yep, we would totally do it again. There are lots of compelling reasons why people would give up their cars – financial reasons, lifestyle reasons, fitness reasons… you know. But we did it for the adventure reasons. My husband and I have always loved having adventures, but having three kids made going on extravagant adventures much harder to organize. When we got rid of our car we kind of forced ourselves into having a year-long biking adventure. And it has been a really, really cool adventure. Lots of great life experiences that we will chuckle about for years to come. What was the part you liked the best? Bike camping. We packed the Yubas full of camping gear and rode to a campsite with some of our friends. All together we had seven kids, four adults, two Yuba e-bikes, four kid bikes, and two touring bikes. A regular caravan of bikers. The campsite was thirty miles away, and we got there about an hour or two before the sunset. After we set up camp we all went to the lake and jumped in. A perfect end to a delightfully exhausting day. There were loads of other cool parts, too. We rode to St. Paul to check out the Science Museum and the capitol building, we rode to the Twins stadium, and generally spent every waking hour during the spring, summer, and fall outside. This past summer was one of the best long summers of my life. What was the part we liked the worst? The winter. Lots of cold and snow, and treacherous riding. We put spiked tires on the Spicy Curry, which helped out a lot, but the roads were still really treacherous. Snow like mashed potatoes on the ground, and ice underneath that. I was pretty worried about pitching it. And the cold was tough too. 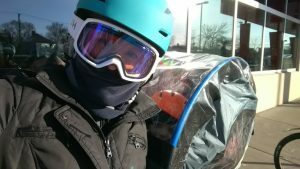 We put a neat tent on the back of the spicy curry, but when it got to twenty below, it was still really cold. We had to pack the kids in full snow gear, and Lewis, our youngest, had a sleeping bag he sat in. I had pogies (which are kind of like gloves for your bike) and a face mask and goggles, and I got pretty frosted going to pick up groceries. I think if we decide to go through another winter without a car we are going to have to get a bucket bike, where you can put an easier tent on the front, pack it full of blankets, and keep the center of gravity really, really low. How did the kids handle not having a car? Grant was a little nervous at first, but it turned out great. It was a lot of fun picking Grant up from School, and going for bike rides as a family. Grant rode his own bike, zipping around the Spicy Curry like a fighter jet around a bomber. Darcy and Lewis were not concerned at all. They probably thought it was normal. This past winter though, when we borrowed a car to go to a Christmas party across town, Grant and Darcy were ecstatic. They both told us that we should get another car soon. In the front seat, my husband and I laughed maniacally. It was going to be another three months. Keep on adventuring! How did the electric bike work out? The bike year would have been almost impossible without the e-bike. I was carrying three or four kids for much of the year, maybe twenty or thirty miles in a day. 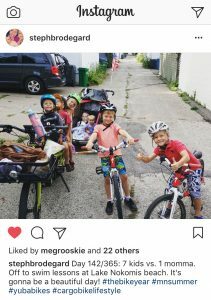 I could handle groceries easily on a regular bike, but those kids, along with all our kid stuff, made the e-bike essential. 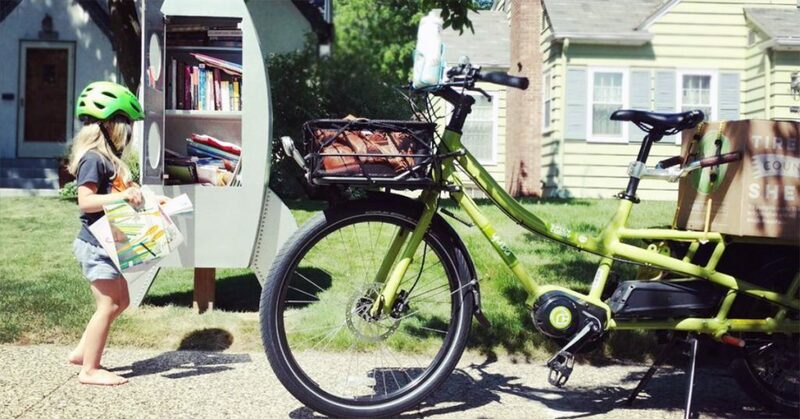 Did you feel bad for using an electric bike? Nope. Not for one minute. Why would you feel bad? I am biking all year long. I am dedicated. My legs are toned and strong. And then, when I want to, I can cruise pass spandexed road bikers like it is nothing at all. You should see their shocked faces when I pass them. Good clean fun. What did other people think when they heard about your adventure? The local newspaper did a story on us this past year. Really good article. I read through some of the comments on line. About two-thirds of the people were really supportive, and the other third got all bent out of shape for some reason or other. They thought we didn’t pay “road taxes”, or that we were not being safe and responsible, or that riding an electric bike was cheating. We did not pay attention to these people. They should eat more vegetables. We found them on Facebook and Instagram, and even our local bike shop. It was really cool hearing about their experiences and realizing that other people had made the same choice we did. Really tough. Not impossible, but we might need to reconsider our bike situation before the next one. Electric bucket bike.. That is going to be key. What will happen next, now that your bike year is over?